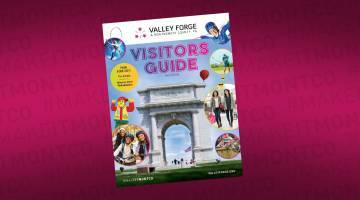 Our Group Tour Planner features group-friendly sites in Valley Forge and Montgomery County, Pennsylvania, as well as suggested tour itineraries. This complimentary full-color piece, set-up as a scrapbook of possible experiences, can be yours by filling out the form below. Note that new itineraries continue to be developed so check the website for updates. Order a copy by filling out the form below.